Thinking back, what was surprising, what may you have done differently if you could start over, Anything else that you want to share with judges? Avaya – I would have liked to have started earlier when I just heard about it, I know that I could influence the 6th graders positively. When we 7th graders joined in, we gave a boost of inspiration. 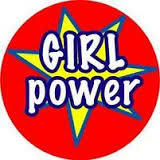 Next year I plan to stay a member of the GirlPower Club and I will recruit new members. Karryassa – Something that was surprising was how even one single event (Bottle Flip) could attract so many students and we had the power to accomplish that! I would like to tell the judges to look at quotes that we made to help encourage others to look forward to coming to Sepulveda. Elena – in the beginning we spent a lot of time researching quotes about reputation. We took a long time before we finally come up with the idea of putting the banners of positive quotes in 6th grade classrooms so the 6th grade teachers have a selection of our kid thought up quotes. We reviewed, made a list, then choose our own favorites, then we all agreed on the ones we wanted. Fatima – About the banners, first we wanted to put positive sayings on the fence with red plastic cups. We bought them, but never followed through with this. I talked with Mr. Ortega, our principal, about banners on our fences. He said that they could be vandalized, so we stopped trying to advertise with banners. Now, Mr. Ortega put banners around our school (we think he got the idea from us! ). He has leadership put them up and take them down daily, so we knew he was right and we would not be able to do that. But after the year moved on, and we started to understand the meaning of the quotes, we still wanted to use them. We made our posters but we wanted something that would last. Rachel – I’m in the Magnet and I am involved in lunch time activities but I see many students who seem to enjoy causing trouble during lunch. We can’t have kids causing mischief during lunch. Our Bottle Flip Challenge, I made a mix of music on my phone that didn’t have any bad words and was popular music all kids like to hear. It was fun and you could see and hear kids singing to the music. I wanted the judges to know that even though I started late that I am excited to be a part of a positive challenge for our school. I want the judges to know that I am a magnet student that always saw the regular school kids as bad. I didn't understand why they didn't join the activities that I do, like the book club. But, the bottle flip and the girls in girlpower really helped me see that I can be part of a solution to change how we all work together to have a great school. Maria - If I think back I would have worked harder on my grades. I was ok in math but I stopped working hard. My grades went down. Even that some of the Team was good in math I didn’t try. My grades went down and so did my effort in GirlPower. So, I think that if you are to call yourself a GirlPower girl, you have to try to keep your grades up. I would like to tell the judges that I want my school to have students that behave and I would not have realized that the best way to fix this problem is us kids, starting with me! That is what GirlPower did for me. Nataly – In the beginning we didn’t really know what to do, but once we got it all together we started beautification, then the Bottle Flip and then the Positive memory… We had a lot of bumps along the way. I think if we started over, I would try harder and put more effort into the project. I would like to tell the judges that even if we didn’t actually change the schools reputation this year, it’s okay because like a quote says (we drew on poster paper) “It takes 20 years to build a good reputation and 5 min to destroy it”. I think that it’s important that we tried, learned and want to continue to keep going with a club. We would never have been able to experience these changes without this project. It was fun and I learned a lot! Mayra – Looking back we got through a lot of things. The bottle flip, gardening, surveys, etc. What I would do differently is pay more attention and be more responsible. I would also work harder in my math class. I think I know that when kids don’t behave they are always the ones who don’t do well in their classes. I don’t think that all kids with bad grades also misbehave because I don’t misbehave. I would tell the judges that when I look at the other kids in my classes, I realize that I was lucky to have this project because I really know how important the behavior of us kids is to the school’s reputation. I am also going to keep improving my math grade. Kennedy – When I think back I remember how I was when I started school. I was sweet. What surprised me was how I changed! I think a big part of my problem was my grades. I wasn’t paying attention and I wasn"t practicing. I made a decision that took me in the wrong direction of this project. I would tell the judges that even if I made mistakes, girls can do anything. I worked hard to get the positive memory forms for parents at Open House and I think this was a good project and I learned that I have to be the one to make the change! Jessenia – When I look back I know that I learned a lot about how to behave, how my decisions and actions are powerful and that I can make a change for me and for the Team. In the beginning I was doing good in math. I was getting C’s. Then when I did a very bad thing I started going downhill. My grades went to D’s with in danger of failing. I was repeating what my older sister did. I should have listened to my Team and worked on my grades. I wrote an apology and asked for forgiveness. I want the judges to know that I can prove I changed. I worked hard. I got an A and all B’s on all my tests in math ever since I changed! I also want to say that all these changes would never have happened and I might have gone down the wrong road if I wasn’t a member of GirlPower. Also I want to say my teacher never gave up on me and it feels good to have good grades, way, way better than bad ones. Oh, and one more thing, now my parents keep closer contact with my teacher and it also keeps my family a part of my change.